The collection is stocked with passionate, fresh-sounding, unrelenting riffs, rhythms and breakdowns. The sound is crisp and up-front, thanks to the excellent mixing and mastering work of Alastair Sims of MOTTOsound (Rush, Three Days Grace). Lyrically, the fragility and fleeting nature of life runs through the disc. 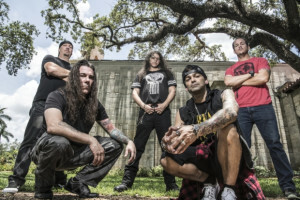 The album’s jarring cover art by Eliran Kantor (Testament, Soulfly) was inspired by the story of a man who lost his three-year-old son at Hiroshima and interred him, along with his tricycle, in a backyard grave. Forty years later, in 1985, the father had his son properly buried and donated the tricycle to the Hiroshima Peace Memorial Museum. The end result is an ambitious album powered by an exciting new band that aims to have listeners headbang with contemplation. We recently spoke to John Snell. What was the writing and recording process like for “Turned to Grey”? For this EP we tracked all the songs individually and then hooked up with [studio drummer] Kevin Talley. I would structure the songs out and that way he would have a good idea of what I was looking for. We wrote the riffs and vocals and sent them to Kevin and told him to take liberties, to write what you feel. So he completed writing the songs, which was awesome. LiveKill does a great job at capturing a very energetic, immediate live sound on “Turned to Grey.” How would you describe your live show? The CD doesn’t justify what we do live. We’re a lot more energetic. [Singer Carlos Guerreros], he’s everywhere, all over the stage. He really gets the crowd into it. You really have to come see us to get the full experience. The songs on “Turned to Grey” run from absolutely blistering to mid-paced and atmospheric, sometimes within one song. Is it important to you to have diversity in your music? I love having the diversity in the songs. It’s good to stick to your genre but that also doesn’t limit us. You can be groovy and slower and still be heavy. The album cover art and your lyrics about the fleeting nature of life are compelling and grab the listener’s attention while adding to LiveKill’s depth as a band. Had you thought of this theme before writing the music? That all came completely after the music was written. I was researching stuff and I saw those images and shadows from people who were vaporized at Hiroshima and I thought it’d be a great subject to write about. My idea for the album cover was to really have that image burn into people’s minds. There’s so many metal albums released every week and people might look at the albums for 15 or 20 seconds. You want people to remember yours. Does LiveKill plan to come up the East Coast for any New Jersey or New York City shows? Our focus and goal right now is to do local shows so we can perfect the sound. We’re looking to June of 2019 to get on a regional tour. How did you go about putting LiveKill together? This was a lot of work over the past two years, finding people that could and want to play this style of music. I would play my demos for people and they would think it was awesome but two days later they’d call back saying they wanted to go in another direction. It sounds easy to play but it’s not that easy. It’s not straight ahead jamming. We go beyond that and that’s what makes us unique. Great article. Thank you supporting Livekill.